I asked my kids what their favourite Netflix show was. The girls were all snuggled up on the couch with their favourite snuggly blankets and their favourite stuffed dolls, and I grabbed the camera and shot a video, asking them to tell me what show they liked watching the best… and well.. their answer kind of cracked me up. It certainly wasn’t one I was expecting. Apparently their current favourite show is Bob Ross, the painter, with his happy little trees and happy little clouds. While I do remember watching The Joy of Painting on PBS many times during my childhood, it’s not something I thought my kids would be begging to binge watch on Netflix. Well he doesn’t have quite the same effect on my kids, who find Bob Ross less soothing and more utterly fascinating. However, as I later learned, he doesn’t quite beat out my six year old’s other favourite new show… Voltron! What about you folks? What bizarre shows do your kids love to watch? ahh Bob Ross was still on the air when my girls were growing up! They absolutely loved him! That is so sweet! 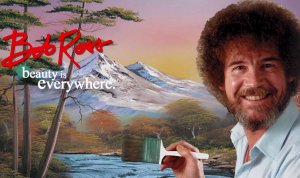 Bob Ross was a big part of my childhood too. I was so happy when it became available on Netflix. I hope my little girl will love watching Bob Ross like yours do! It’s so inspiring and even therapeutic watching him paint.